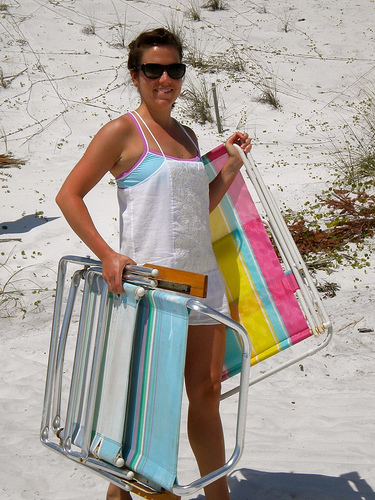 Folding beach chairs are on the top of our beach supply list for our family beach vacations. No longer are these chairs just chairs, oh, no ... they now include coolers, drink holders, storage pouches, cell phone pockets, head rests, and umbrellas. Not everyone enjoys lounging on the beach with a towel or a blanket. 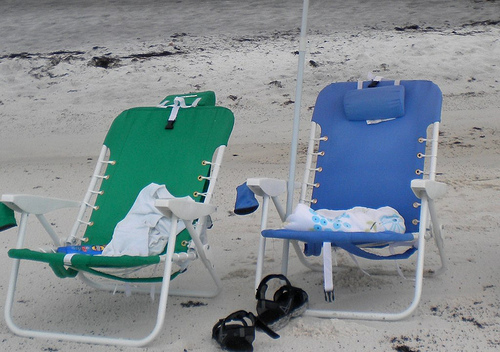 Most people prefer the comfort and convenience of beach chairs. This type of chair not only ensures a sand-free bottom, it provides a sturdy back rest so you can really relax. Many of these chairs also include side pockets, cup holders and canopies. You just may never leave your chair with all of these features! Aluminum beach chairs are lightweight and easy to carry to the beach, especially those that incorporate a couple of padded straps so they can be carried like a back pack. Hands are now free to carry your beach bags, coolers or umbrellas. 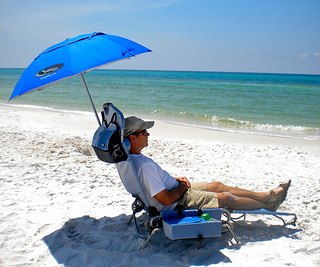 So many practical features are now included in this type of beach chair - but my favorite ones are the towel rack, insulated cooler and cup holders for beverages or cell phones. Recline and rest your head on the adjustable headrest, enjoy a cool beverage found in the included insulated cooler and rest your arms on the wide armrests. The Rio brand is a well respected outdoor gear company known for their quality and innovative designs. Rio beach chairs offers features that make you realize you could never go back to just a plain folding beach chair. 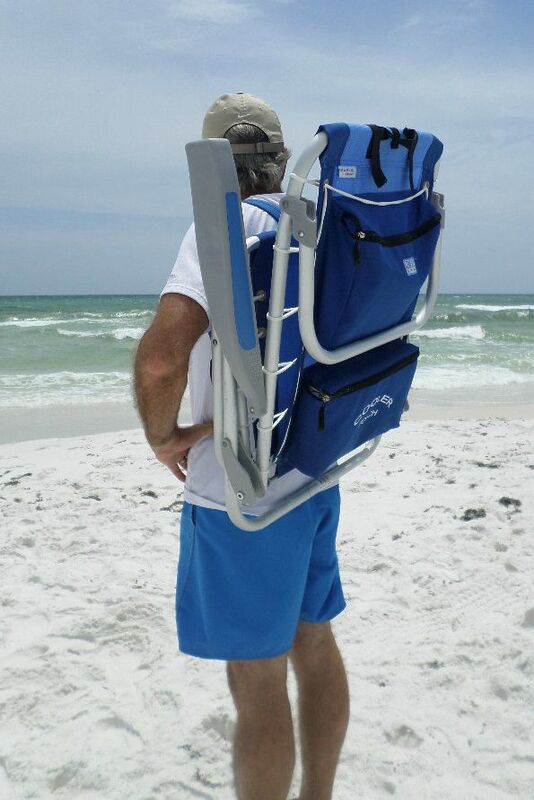 Even though they cost more than cheap beach chairs, you can get so much more than just a chair - an adjustable headrest, storage pockets and a cooler just to name a few. 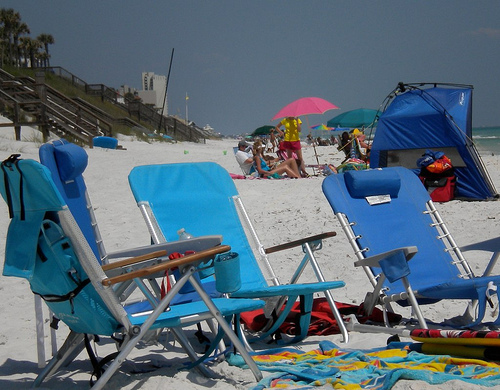 Beach chairs with canopies provide a welcome relief from the hot sun. 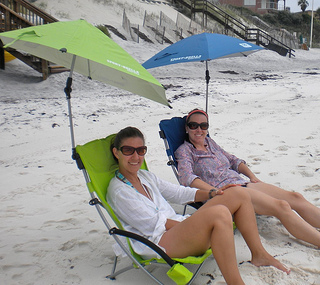 Many folding beach chairs come with a canopy or umbrella or you can purchase a clamp on beach umbrella separately. These umbrellas do what they say - they simply clamp onto the arm of the chair. Adjustable or reclining beach chairs provide the option to tilt back. You can find these chairs with different mechanisms to adjust the chair and some have the ability to lie completely flat. See the notches on the right arm rest? This chair has 5 different positions. Get one with wide wooden arm rests and cup holders or with a large enough pocket to carry your towel and snacks. 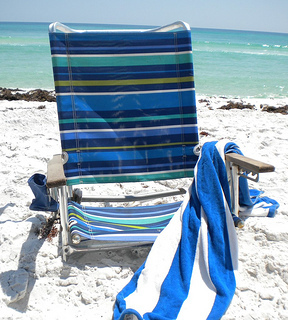 Two mesh cup holders, a cushioned headrest, an organizer with a zip pocked along with a lined cooler makes this a favorite chair for the beach. Throw this over your shoulder using the carrying strap and get ready to set yourself down on your favorite sandy spot. A low 14" off the ground and a 300 lb weight capacity means it will be a favorite chair for anyone in the family. Looking for a durable folding beach chair that will last for years and provide ultimate comfort? Beach lounge chairs are the ultimate in relaxation. They can be adjusted to many different positions and can completely lie flat for an afternoon siesta. 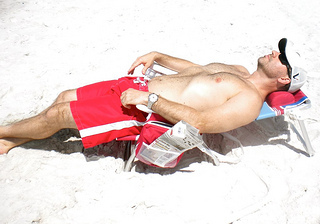 The movable headrest makes napping so easy you may find yourself still at the beach after the sun goes down. Or you may enjoy a more upright position to monitor kids or to take in a new best selling book. See the great pockets on the side of the chair to hold your newspaper, magazine, book or electronic book reader? A folding chaise lounge is a step up in comfort and relaxation. My husband was delighted when I found this lounge chair complete with headrest, coolers, umbrella and iPod speakers. It folds out and back up in seconds. The best part is the handle and wheels so that it can easily roll to wherever you want to go. There is no need for lifting and carrying. Clip on fans make all the difference in comfort at the beach. Keep cool and keep the bugs away with this USB rechargeable portable fan. 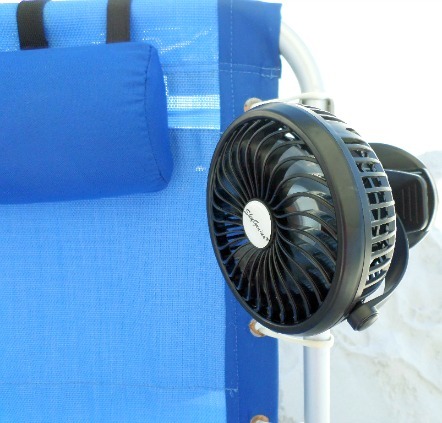 Clip it onto your beach chair, canopy or tent for a cool, constant, comfortable breeze. If you are looking for a really sturdy beach chair that can hold some extra weight, a wooden beach chair is your best option. Many other people choose wood because of it's classic look and timeless style. Others like a wooden frame because these chairs are heavier than your aluminum ones so they don't blow over as easily in the wind. 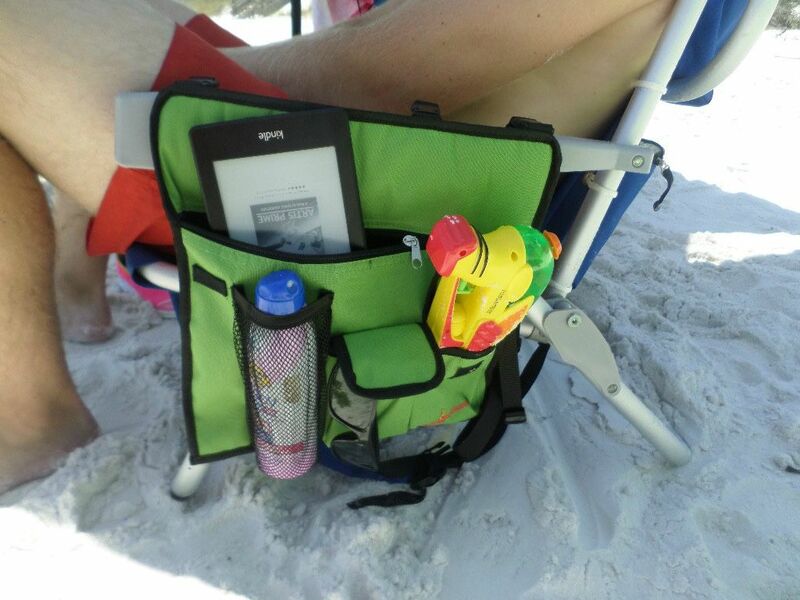 Keep your stuff handy with a beach chair caddy or attachable side table. 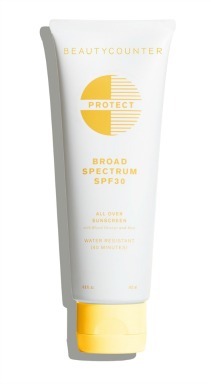 No more searching for sunscreen or your cell phone in the oversized beach bag. 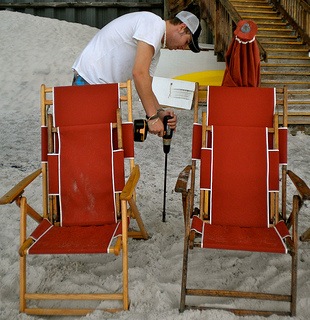 Drinks remain sand free with Spiker drink holders that you place into the sand right next to your chair. A clamp on umbrella means you can move your chair anywhere you want to - away from the crowd for some quiet reading time or perhaps like me you like to sit near the water to cool your feet off with some splashing waves. 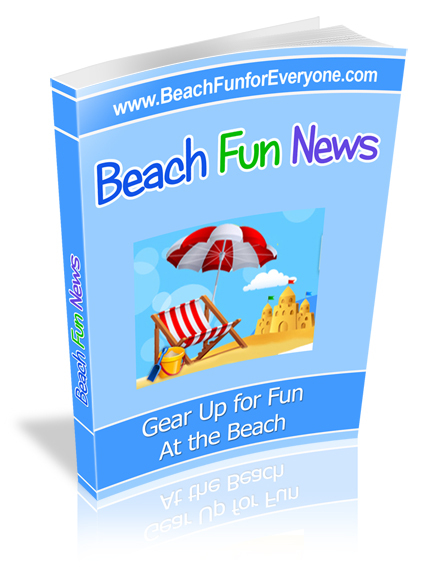 It all boils down to what you want and how much you want to pay for your folding beach chair. But keep in mind, sometimes if you pay a little more upfront, you end up saving money in the long run. A folding beach chair is designed to enhance your beach vacation or day at the beach, so get the one that provides the features you are looking for.